^ a b Rogers, John J. W. (January 1996). "A History of Continents in the past Three Billion Years"
Sankaran, A. V. (2003). "The supercontinent medley: Recent views". Current Science 85 (8): 1121-1123. Rogers, John J. W. (January 1996). 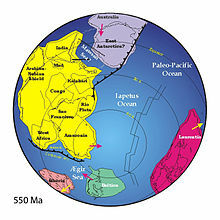 "A History of Continents in the past Three Billion Years"（過去30億年の大陸の歴史） The Journal of Geology 104 (1): 91?107. JSTOR 30068065. Noce, Carlos M.; Pedrosa-Soares, Antonio Carlos; da Silva, Luiz Carlos; Armstrong, Richard; Piuzana, Danielle (2007). "Evolution of polycyclic basement complexes in the Aracuai Orogen, based on U-Pb SHRIMP data: Implications for Brazil-Africa links in Paleoproterozoic time" Precambrian Research (159): 60-78. doi:10.1016/j.precamres.2007.06.001.